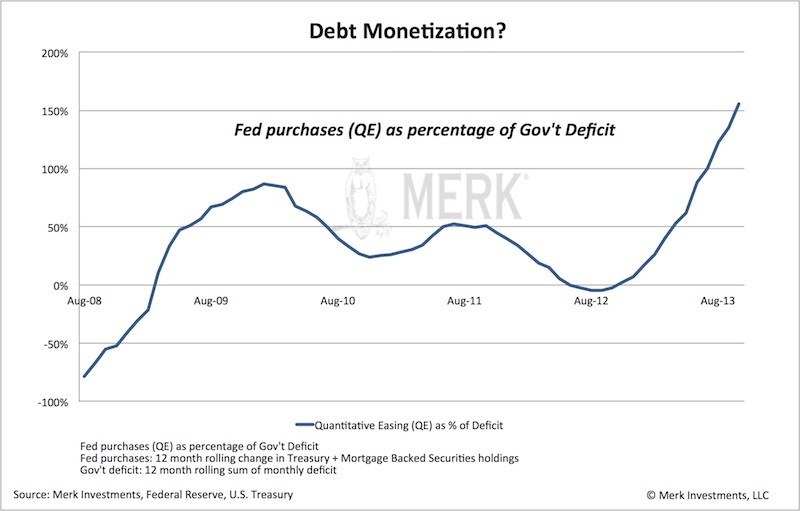 Merk Insights - Is the Fed increasingly monetizing government debt? Is the Fed increasingly monetizing government debt? Fed Chair Bernanke vehemently denies Fed “monetizes the debt,” but our research shows the Fed may be increasingly doing so. We explain why and what the implications may be for the dollar, gold and currencies. What is debt monetization? A central bank is said to monetize a government’s debt if it helps to finance its deficit. The buying of Treasuries by the Federal Reserve is a clear indication that the Fed is doing just that, except that Bernanke argues the motivation behind Treasury purchases is to help the economy, not the government. The no-taper decision increased the Fed's monetization of US debt. Gold may be more than insurance. Brace yourself for an escalation of Currency Wars. To what extent does the Fed monetize the debt? The above chart shows that since the onset of the fall of 2008, the Fed has purchased enough Treasuries and Mortgage-Backed Securities (MBS), together, “quantitative easing” or (QE) to finance a substantial part of the government deficit. Indeed, by deciding not to “taper” off its purchases, the Fed is engaging in sufficient QE to purchase all debt issued and then some. Shouldn’t one exclude MBS purchases in analyzing debt monetization? Buying MBS may provide the appearance that the Fed is not monetizing the debt when in fact it is. Don’t take our word for it, but the market’s: in a recent presentation to the CFA society in Melbourne, Merk Senior Economic Adviser and former St. Louis Fed President Bill Poole points out that the spread between 30-year fixed-rate mortgages and 10-year U.S. Treasury bonds have been virtually unchanged as a result of MBS purchases; from 1976 to 2006 the average spread was 1.74%. From May 2011 to April 2012 it averaged 1.76%. As such, the direct impact of QE on spreads has been extremely limited. If it sounds surprising, consider that investors have an array of choices that are highly similar: aside from currency risk, how different are German Treasuries versus U.S. Treasuries? Highly rated U.S. corporate issues versus U.S. Treasuries? They all have distinct risk profiles, but there’s a good reason why absent of issuer-specific news, these securities tend to trade in tandem. As such, the Fed is really just sipping with a straw from the ocean: setting rates may be more a result of communication (the “credibility of the Fed”) rather than the actual purchases. If rates are set by words rather than action, doesn’t that prove the point the Fed is not monetizing the debt? We agree that talk is cheap. But talk doesn’t always move the market; as confidence in the Fed’s ability to control rates erodes, policy becomes ever more expensive: cutting rates, emergency rate cuts, Treasury purchases, Operation Twist, and moving to an explicit employment target are all escalations of a policy to “convince” the market to keep rates low. And along the way, the Fed has to spend more money. Ask the Fed, and they’ll tell you their operations are profitable. Clearly, as the Fed creates money out of thin air to buy income-generating fixed income securities, the more the Fed “prints”, the more profitable it is. Except that there’s no free lunch and pigs still can’t fly. By all means, no central bank in their right mind would start out with a policy to monetize debt. But as the chart above shows, the Fed now spends over 150% of government deficit to hold rates down, suggesting that its firing power is eroding. If and when we come to the stage that the Fed were to explicitly monetize the debt, it may need to buy a high multiple of what it currently does and might still fail to keep rates low. It’s a confidence game. What happened when the Fed decided not to “taper” its bond purchase program? As the chart above shows, something went wrong, very wrong. As tax revenue has picked up throughout the year, government deficits have come down. As such, reducing QE would have been warranted. By choosing not to “taper,” one can argue that QE has actually increased, as the Fed is buying above and beyond newly issued debt. Note the Fed will push back yet again, arguing it cannot buy debt directly from the government only in the secondary market. But that may well be semantics. As a large bond manager has pointed out: in the absence of QE, we might have to sell debt to one another, rather than to the Fed. Where’s debt monetization heading? The way we see the dynamics playing out, this confidence game will go on for some time, yet we may increasingly be seeing cracks. Lower government deficits may be a short-term phenomenon as over the long-term the cost of entitlements and interest payments may rise substantially, highlighting that deficits may not be sustainable. In 10 years from now, the Congressional Budget Office (CBO) estimates the U.S. government may be paying $600 billion more a year in interest expense alone; indeed, if the average cost of borrowing went back up to the average cost of borrowing since the 1970s, the government may need to pay $1 trillion more per year in interest expense alone. To us, this suggests the biggest threat we are facing may be economic growth. That’s because the bond market has been most sensitive to good economic data; yet, should the bond market sell off (increasing the cost of borrowing), the cost of financing U.S. government deficits may escalate. We already have a Fed that has indicated interest rates will stay low for an extended period. In some ways, the Fed has all but guaranteed that it will be slow in raising rates. We interpret that as the Fed being slow to rising inflationary pressures that are likely to increase should the economy ever pick up again. This is all too abstract – how will this play out? If you think this is abstract, think Japan. Let the Japanese be successful with their policies, let them achieve sustained economic growth. What do you think will happen to Japanese Government Bonds (JGBs)? JGBs might plunge, making it difficult, if not impossible, to finance Japan’s massive government debt burden. Few observers doubt that the Bank of Japan (BoJ) may step in to help finance government deficits. That’s debt monetization. We think the valve for Japan will be the yen that won’t survive this. When we discuss this with investors, most agree that this is a real risk for Japan. But don’t kid yourself: even if we may be able to kick the can down the road for longer in the U.S., we think it may be hazardous to one’s wealth to ignore the risks posed to the dollar due to a toxic mix of monetary and fiscal policy. How do I prepare as an investor? The way we look at the world is in terms of scenarios: if a scenario is sufficiently likely, we think investors should take it into account in their portfolio allocation; professional investors may even have it as their fiduciary duty. To us, the short answer is that there is no such thing anymore as a risk free investment and investors may want to take a diversified approach to something as mundane as cash. Investors may want to consider throwing out the risk free component in their asset allocation. That’s because the purchasing power of the U.S. dollar may be at risk. Is gold the answer? Gold has performed rather poorly this year and is increasingly being written off. Yet, those writing off gold should think twice about where they see the economy and the Fed heading. If one believes we will return to a “normal” environment and we’ll live happily ever after, maybe those gold naysayers have a point. But keep in mind that incoming Fed Chair Janet Yellen stated during her confirmation hearings that we shall return to a normal Fed policy once the economy is back to normal. To us, that’s an oxymoron: we cannot return to a normal economy when the Fed prevents risk being priced by market forces. To us, gold is more than “insurance” to adverse scenarios as some say, as we find it difficult to see how we’ll be facing positive real interest rates for an extended period over the coming decade. Is a basket of currencies the answer? The Chinese government diversifies its reserves to a basket of currencies, clearly adding currency risk to their portfolio. Conversely, U.S. investors may want to consider diversifying to a basket of currencies if they believe we ultimately have the better “printing press” than the rest of the world? But isn’t it more complex than that? In some ways, yes. Governments won’t give up without a fight. We believe policy makers want to do the right thing, except that the road to hell might be paved with good intentions. Just consider if Japan truly has a problem: Japan is no Cyprus, meaning that shockwaves of a Japanese government in turmoil might be felt around the world. Aside from cash not being “safe,” political stability may also continue to erode throughout the world, as citizens worldwide dissatisfied that their wages don’t keep up with an increasing cost of living elect ever more populist politicians. The only good news we can see is that our policy makers may be predictable and an investment strategy based on staying a step ahead of policy makers might be worth considering. Think currency wars, and think diversifying on a more pro-active basis. We are not suggesting investors become day traders, but we think the currency markets may be well suited to take positions on how one believes these dynamics may play out. Please subscribe to Merk Insights and follow me on Twitter to learn how policy makers impact investors. Also join me for a Webinar on Tuesday, December 17, 2013, discussing how to diversify when bonds are at risk and stocks expensive. Manager of the Merk Funds. This report was prepared by Merk Investments LLC,and reflects the current opinion of the authors. It is based upon sources and data believed to be accurate and reliable. Merk Investments LLC makes no representation regarding the advisability of investing in the products herein. Opinions and forward-looking statements expressed are subject to change without notice. This information does not constitute investment advice and is not intended as an endorsement of any specific investment. The information contained herein is general in nature and is provided solely for educational and informational purposes. The information provided does not constitute legal, financial or tax advice. You should obtain advice specific to your circumstances from your own legal, financial and tax advisors. As with any investment, past performance is no guarantee of future performance. Thank you for your interest in the Merk perspective. To serve our audience better and to continue offering our insights free of charge, please enter your information below to continue reading.